This weekend I made the quick 6 hour jaunt to visit the famous Turkish city of Konya -former capital of the Seljuk empire, site of the mausoleum of a certain legendary Sufi poet and original site where the Mevlana whirling dervishes first…whirled .After experiencing smoky overnight train rides from hell in Egypt, slow old ferries sputtering their last breathes across the Red Sea and 28 hour bus journeys from Iraq that involved border waits of 6 hours in and of themselves, I am really loving these short efficient bus rides to different cities within Turkey, I gotta say! My “efficient” journey began with a woman sitting next to me on the bus who, having not bought actual seats for her identical twin preschool aged daughters, had to share her cute brood of children with me and my seat, in a not-so-efficient way. In and of itself this wouldn’t have been an issue really (the concept of personal space doesn’t seem to exist in Turkey -or elsewhere in the mid east- but i've just surrendered to this and accepted it as much as part of the life as tiny glasses of tea or blue evil-eye keychains), however, to climb the 1000 feet from sea level in Mersin to the high hazy plains of Anatolia requires considerable twisty roads on the edges of cliffs and mountains. Suffice to say, the complimentary ice cream treats courtesy of Konyator buslines were rather ill-timed, as one of the girls proceeded to throw up all over herself and her sister , who at that point was laying on the floor under my legs. I was boxed in to the whole situation (having the good fortune of landing a window seat for once in my life), desperately trying to get the attention of the assistant bus driver, frantically handing tissues to the mother and trying to keep myself clear of it all because I really hadn’t brought much more than a change of underwear and toothpaste on this trip, and really would rather not smell of puke for my life-changing spiritual awakening at the shrine of Rumi’s grave, thankyouverymuch. Vomit aside, I made it safe and sound to Konya to stay with a couchsurfing friend I had messaged sometime ago, Huseyin (and his charming 60 year old dad who lives with him). It turned out to be such a great choice to couchsurf here, as Huseyin is one of the smartest most inspiring people I have met in ages and staying with him was like staying with an old friend. I have never felt so comfortable around someone in such a short span of time, really. On the second night’ (when 3 other travelers from France showed up a day earlier than he thought and the spare room was too crowded), he even gave me his very bed to use and he slept on the couch, without hesitation. Unbelievable. Anyways, I spent most of Saturday wandering the center of the city, and sitting on the floor of the Shams Tabrizi mausoleum and mosque (such a wonderful little place, I actually came back later in the day to just…sit some more). It felt really surreal to be there, kind of overwhelming and perfect and I cant really articulate exactly how or why in a way that will make sense and not sound too flaky, but it felt so… meant to be, I guess you could say. 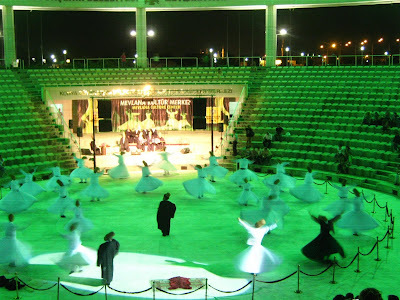 The Shams mausoleum in particular felt this way, although of course the Mevlana museum and Rumis mausoleum were stunning and overwhelming as well, nevermind the sight of some 30-odd whirling dervishes performing the Sema dance, outside later that evening, on a gorgeous July night. Konya is known to be the most conservative city in Turkey but the great thing about Turkey is that what equals "conservative" here wouldn’t even register on the scale of conservatism in other places ive recently traveled. I can wear whatever I want, not be harassed one bit, go into the mosques only removing my shoes and not having to don some ridiculous wizard-like cloak (which really ruined my experience of the Umayyad mosque in Damascus I must say– a windy day and this stupid garb blowing about and I couldn’t exactly have anything even resembling a “spiritual experience”, especially while all my male friends stood there smugly in their t-shirts and jeans and I wanted to scream). It was also such a breath of fresh air to meet my Sufi friend Huseyin, the best example of what it should really mean to be Muslim, such a good person I cant almost believe it, To hear him, this Sartre and Camus obsessed, socialist, actor/filmmaker, talk about his dislike of conservatism and tell stories of how fundamentalists give him looks while he prays at the mosques, because hes wearing shorts or whatever, and how absurd it all is, was so refreshing. I wish every hypocrite muslim I met on this trip, (the men in Egypt yelling sexual provocations as me, the married Bedouin men in Jordan who tried to get me to sleep with them, the various ignoramuses who questioned me in Syria as to why I wasn’t married yet and “didn’t like” my answer of “because I haven’t met anyone ive wanted to marry and anyways if I WAS married I probably woulnt be here, travelliing independently through your country so whatever, the grass is always greener, im just enjoying being single, for now”), I wish they could have just one day with Huseyin and see things differently. If the whole world thought in such an enlightened way maybe the world wouldn’t be in such chaos, seriously. On a personal level, I really needed to meet him at this time, as my opinion on religion had been soured quite a bit by my various recent experiences, and hes really the first person to make me see differently and see the beauty behind Islam, the essence beneath the dogma, free from hypocrisy or judgement. So Thank you Huseyin! Konya was absolutely fantastic and it has left me feeling really happy . Huseyin told me that it is said if you are feeling incomplete when you walk into visit Rumi’s grave, by the time you walk out, if you are sincere in your seeking, you will have found what was missing and will leave a whole person. Something like that anyways. And, right now, not too sound too new age or mushy, I can honestly say I really do feel very… whole.